If Piero Umiliani proved anything during his long and prolific career, it's that he was one of the greatest musical shapeshifters the world has ever known. Delving into everything from cinematic jazz, exotica and rock-laced psychedelia to ambient synth music, disco and avant-garde experimentalism, the late maestro covered a lot of sonic ground in his decades-long career — not to mention gave us perhaps the biggest earwormer of all time, "Mah Nà Mah Nà." Now shining a brighter light on Umiliani's celebrated '60s period is Al Cinema Con Piero Umiliani — an impossibly rare 1969 compilation that's finally been unearthed by Sonor Music Editions. 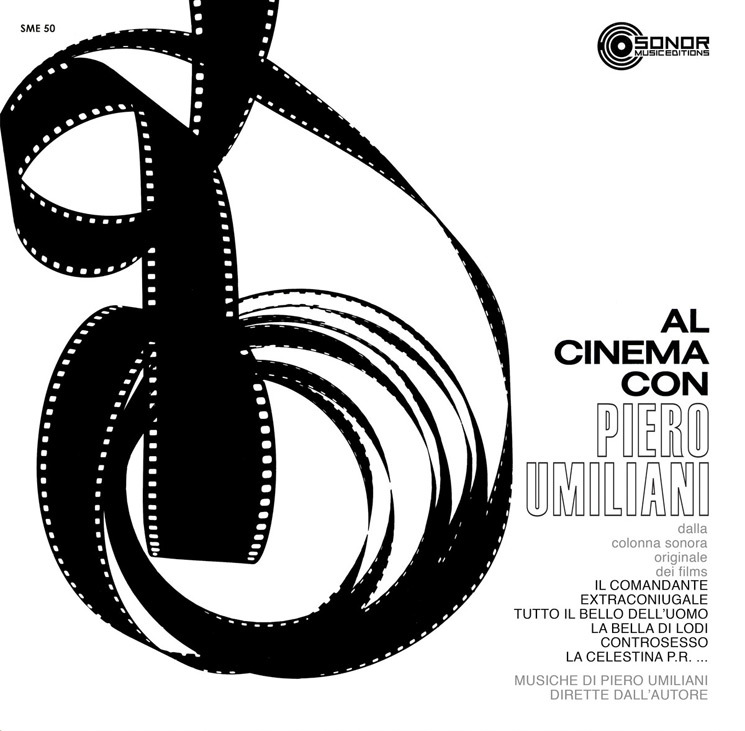 Al Cinema Con Piero Umiliani originally came as part of the RCA Italiana SP 8000 promo series, and only 100 copies were initially pressed. This means that these songs have remained essentially buried and unheard over the years to all but the most devoted of Umiliani heads, making this expertly remastered reissue more than a little warranted. Featuring tracks composed for such films as Extraconiugale, Tutto Il Bello Dell'uomo and La Bella Di Lodi, the comp actually fills its entire first side with songs Umiliani wrote for the 1963 comedy Il Comandante. Despite kicking off with the incredibly buoyant waltz of "Titoli Dal Film 'Il Comandante,'" Umiliani soon starts showing off his jazz chops, keeping things light and breezy as he offers a playful mix of instrumentals. And while these primarily stay in a trad jazz sort of mode, you can hear Umiliani flexing his compositional muscle by inserting odd bits of instrumentation and peculiar melodies, with some big, sweeping string movements thrown in for good measure. Lato 2, on the other hand, will prove much more satisfying for those Umiliani heads looking for the sort of sonic game-changers he would go on to write. Complete with the help of the legendary vocal ensemble I Cantori Moderni Di Alessandroni, the song structures open up considerably, with Umiliani throwing in an amazing mix of blaring spaghetti-western horns, crime-story jazz guitar work and some beautiful female vocal leads. The songs also highlight Umiliani's increasingly innovative recording techniques, as the songs come feeling surpassingly dense and layered, yet never bogged down and overcooked. Bonus points also go to "A Bocca Chiusa," which may be the most beautiful bossa nova song you've never heard.